We had a fantastic week. Fantastic weather. What a way to celebrate our 1st anniversary. We love the castle and will definitely be back. Second visit in 5 weeks. Last hurrah for the summer and the hols and a perfect way to end it. Toured lots of beaches and paces of interest and enjoyed every minute. Hope to come again, what a great house. What a spectacular location and fascinating 'castle'. We loved the character, the spaciousness and the marvellous views from almost every window. A really great place for a holiday. Wonderful place to stay. Gorgeous views, thank you. Our time in Teignmouth will always be remembered. Adults and children fell in love with the place. Exciting and luxurious. Lots of places to visit within easy reach and always delighted to get near 'home' and spot the tower. Hope to come again soon. What a fantastic building and view. We had a incredible hen weekend. What a treat staying in a place like this -thank you it was a fab few days. 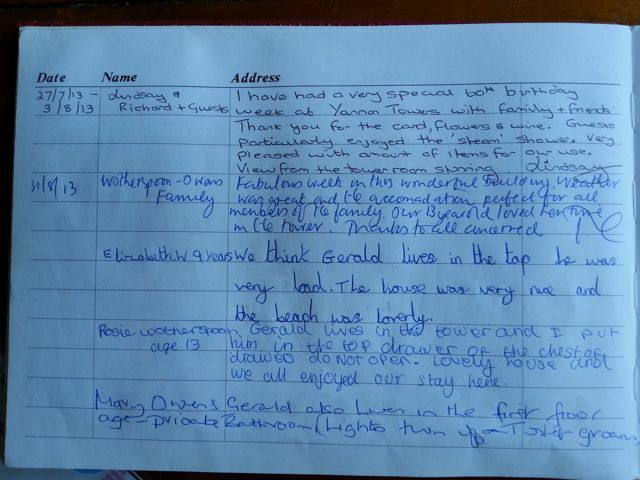 Jan 2012 - We had such a lovely time at the towers, very well catered adn furnished, beautiful and thoroughly relaxing. 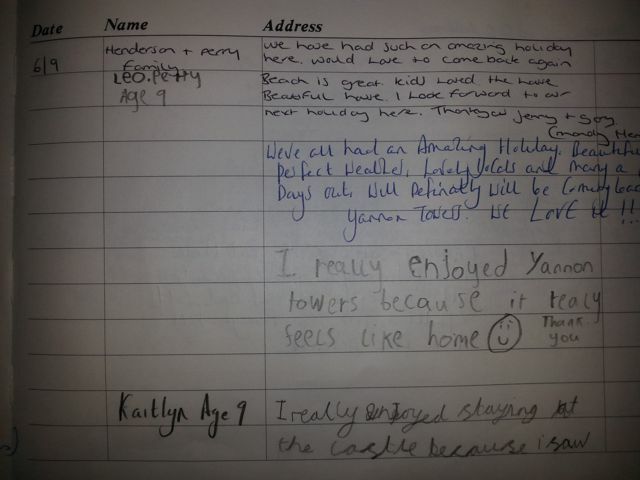 Dec 2011 - We have really enjoyed our stay in your hour/castle. Plenty of space for children and adults. Kitchen v.well equipped. Nov 2011 - We had a lovely weekend, lots of people with lots of space in a very interesting, warm house. Nov 2011 - Had a lovely getaway weekend with family and friends in your splendid castle/folly. Lovely views, great character and even felt the presence of the ghost in the tower! Great time had by all. Nov 2011 - We had a lovely time. Great house with lovely views and lots of character. A perfect venue for a proposal! 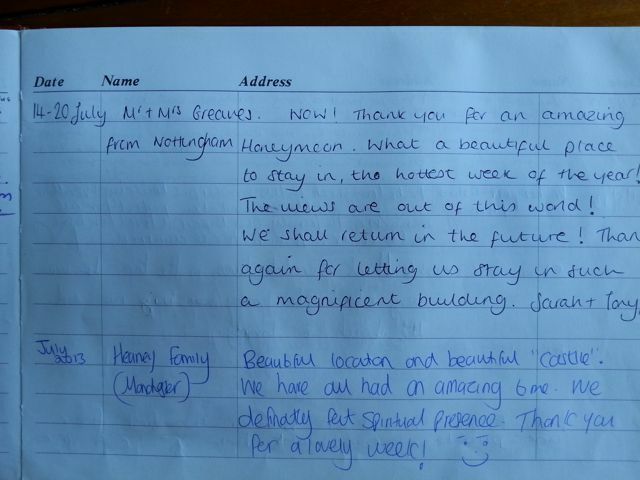 Oct 2011 - We have all had a fantastic stay in such a beautiful 'folly' Thank you very much for a lovely holiday. Amazing views and great facilities. The Children absolutely loved the house and were fascinated with the stairs. 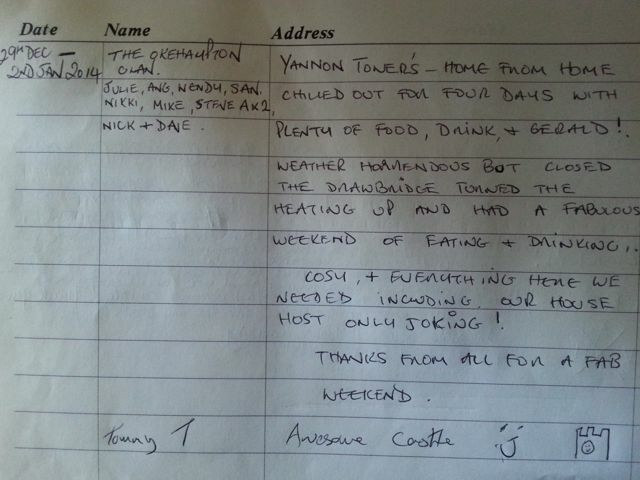 My parents stayed in the tower room and adored it. The view was amazing and with their hot water bottles they were very cosy. We went to Coombe Cellars on Christmas day and it is quite frankly the loveliest pub I have ever been too, absolutely gorgeous and we enjoyed a mulled wine and winter pimms or two. We had a great family Christmas, played board games, hide and seek, walked and only turned the TV on to play �who wants to be a millionaire DVD game�, but we could not find the remote control for the DVD player (owners have found again). We were very glad of having two fridges (considering the amount of stuff we bought with us!!). A truly wonderful experience, thank you very much indeed. The castle was amazing. It made me feel that perhaps I should have been born into royalty. Will definitely come again. Lovely Castle, great views. Really comfortable and we had a fantastic time. The Tower room was amazing, even in the middle of a storm - Can't wait to come back. Wicked time in a fantastic folly. Will be back soon. © Copyright Engineering Adventures , all rights reserved. Last Updated 2019-01-28.